Drag the River is an alt-country band hailing from Fort Collins, Colorado. Drag the River began when Jon Snodgrass (of Armchair Martian) and Chad Price (of All) began writing some country songs on the side. During the 10 years since their beginning, both Armchair Martian and All have ceased to exist and Drag has become the main outlet for both songwriters. Drag The River has accomplished so much without label support. They tour all year long, self-release their records, and secure publicity, all on their own terms. Hometown Caravan Records released the Drag The River 7" on August 9th. It's the first installment of Elmer's fishing series, which consists of two older unreleased songs on fishing & one new song mentioning a river.This is their first label supported release in years. Fans of Uncle Tupelo, The Replacements, Lucero, and LImbeck will love this album. The band is perfecting a sound they call Country and Mid-Western! 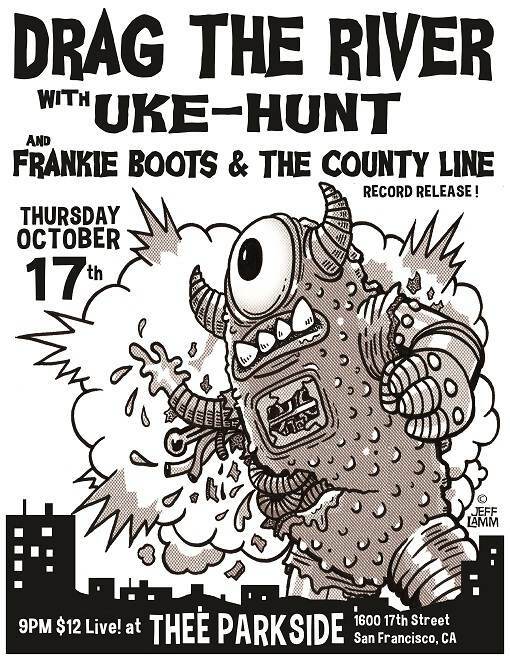 Uke-Hunt are: Spike Slawson (Me First & the Gimme Gimmes, Swingin' Utters) on ukulele and vocals, Randy Burk (Small-Time Napoleons, Filthy Thieving Bastards) on various percussion instruments and vocals, and Jamin Barton (Kelley Stoltz, The Titan Ups, Ramshackle Romeos, Bone Cootes and the Living Wrecks) on saxophone, melodica, harmonica and various other janky instruments. 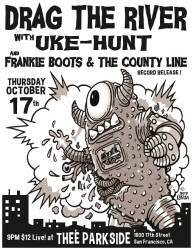 Uke Hunt play outsider pop tunes, country standards, '80s new wave hits, and tender love ballads all totally unplugged, yet fully electric. More mobile than an Airstream, Uke Hunt can be wherever they're needed before you can say ukulele!